If I had to pick a name of an author that had floored me with each book they have written, yet they seem unknown in reading circles, I would put Mike Knowles at the top of the list. Knowles has been consistently putting out books that are top notch since 2008 when he burst onto the scene with Darwin’s Nightmare which introduced his series protagonist, Wilson. 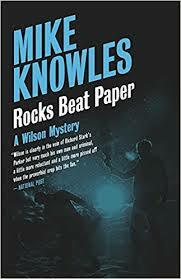 Knowles has since release 5 books with Wilson as the lead and each one was better than the one that came before it, however, he may have saved his best for his most recent addition to the series, Rocks Beats Paper. For the uninitiated to the series, Wilson is a man who keeps off the radar. He keeps a very small circle of colleagues and even fewer friends. He prefers it this way because he makes his living pulling heists. Not quick “stick ‘em up” robberies, but large scale ones with big payouts. He tends to pull a job and disappear for large stretches of time while he plots his next job. In this fast-paced and well plotted book. Wilson comes out of the woodworks to be a part of a 10-million-dollar diamond heist. The first quarter of this book shows you the great depths he puts the crew through to plan for every obstacle and possible outcome of every possible situation they may encounter. Wilson is nothing if not a meticulous planner and he is not afraid to walk away from a job if there is the smallest chance he doesn’t escape with his freedom and his desired spoils. When the inside man from this planned job dies in a car accident, Wilson is forced to let the planned job die with him. But that doesn’t stop him from resurrecting a new plan for the same score. Wilson is brilliant in his prepping and his planning and this novel is a lot of fun to read. I have seen many reviews that compare the Wilson novels to the Richard Stark Parker novels. I have only read 1 Parker novel, so perhaps I am not the best to comment on the comparison, but I found this novel to be up to par with the Parker novels and I actually enjoy the Wilson novels more. I am sure that comment won’t sit well with the loyal Parker fans that read this review, but if they at least read a Wilson novel to see how it rates, my goal for this review is accomplished. Knowles deserves a much wider audience than he seems to have. His writing is crisp, plotting is tight, and all his novels have left me eagerly waiting his next release. Do yourself a favor and grab this book and take it for a spin.